Kerosene is highly flammable. Do not use it around sparks or open flames. Puppies are especially vulnerable to kerosene poisoning. Some topical products include kerosene as an ingredient. 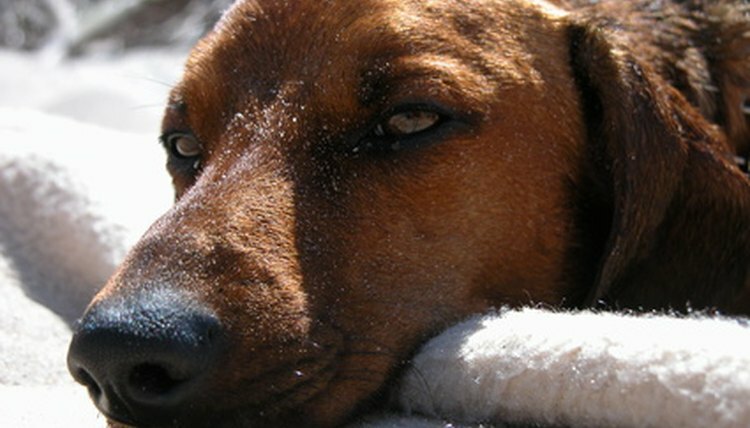 It may also be an inert element in flea-fighting topical applications for dogs. Kerosene—or coal oil—is a petroleum product that is used in both heaters and camping lamps. It is possible to get rid of fleas using kerosene, but it should only be used as a last resort due to its flammability. Fleas have four stages—egg, larva, pupa and adult—but the preventive effects of kerosene fight only the egg and larva stages. Pupae and adult fleas may escape from the presence of kerosene. Use kerosene with extreme caution. Clean your floors with with a bucket of hot water with 7 oz. of soap and 3.5 oz. of kerosene. This will kill the larvae of fleas and prevent eggs from hatching. Wipe down your dog's kennel with kerosene and lightly spray the surrounding ground with kerosene. Use an inexpensive pesticide pump sprayer, which can be found in the gardening tool section of your local hardware store. Keep your dog away from his kennel for several hours following the application to avoid subjecting him to strong fumes. Give him access to the kennel only after most of the fumes have evaporated. Treat brushes and combs with kerosene to kill eggs and larvae, which can lodge in the brush's bristles and between comb teeth. Pour a solution of 1 part kerosene and 2 parts water into a shallow metal baking pan. Soak brushes and combs for about an hour to kill larvae and eggs.